This widget allows the user to search for items on eBay or to watch the items he/she is bidding on. The widget makes extensive use of the eBay API. Add photos from any site, then record voice captions for each slide. 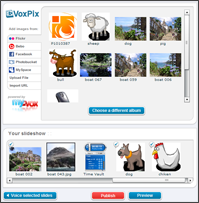 VoxPix then wraps it all together in a widget that can be included on any page. The user can add photos from various sources including Flickr, Facebook, MySpace, Bebo, Photobucket, or can upload them from her hard drive. Tools: Flash / Flex Builder, Photoshop, PHP / MySQL for web backend, and several web APIs: Flickr, Facebook, MySpace, Bebo, Photobucket. The slideshow is published using the Gigya API. Displays a selection of 5 stock symbols, along with some news and special announcements. The data displayed by the widget can be edited remotely via an admin panel done in PHP / MySQL. A widget version of the classic Solitaire game. The aim is to remove all the marbles - but one - from the board. To remove a marble, just move another adjacent one over it. 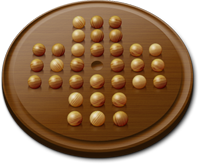 The game ends when all the marbles have been removed or when there are no possible moves. This widget allows the user to enhance his/her eBay auctions by associating a MyVox voice over to them. 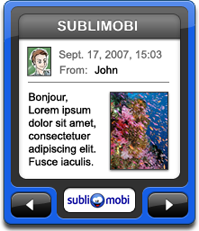 Displays images and texts from SubliMobi blogs. Brings the functionalities of the Harvest time tracking service to the desktop.